One of the most common hypotheses that I hear with regard to possible non-coding DNA function is that it serves to protect genes against mutation. Junk DNA, according to this proposal, is there to provide a defensive shield against mutagens (usually this includes UV, ionizing radiation, chemical mutagens, viruses, and/or oxygen radicals). I am very skeptical of this explanation, but I am willing to take it seriously if it is studied seriously. In fact, one of my current graduate students first came to talk with me when he was an undergraduate and asked me about this possible function. For his undergraduate research project, we tried to test it using Drosophila species with different genome sizes exposed to chemical mutagens and screened for phenotypic effects (we learned a lot about how one might design such an experiment, but the results were inconclusive on the first attempt). That's much more than most proponents of this hypothesis try to do, and I suspect that's one reason that it has not really gained much ground in the genomics community. Various visitors to this blog have brought up the hypothesis in one form or another, so even though little or no data is ever presented (and counter-examples are generally dismissed out of hand), I will once again treat the idea seriously. Specifically, here is my overview of what proponents of the mutation protection hypothesis need to know and what they need to do if they want this to move out of the armchair and into the realm of science. I. This is not a new idea. "Recent reports indicate that the DNA of constitutive heterochromatin is composed to a large extent of short repeated polynucleotide sequences, termed satellite DNA. This discovery has necessitated a critical review of current ideas concerning the origin and function of this portion of the genome of higher organisms (4-12). A careful appraisal of the information that has accumulated about heterochromatin since the time of Heitz [late 1920s, early 1930s] and on satellite DNA during the last decade suggests that these entities have vital structural functions: they maintain nuclear organization, protect vital regions of the genome, serve as an early pairing mechanism in meiosis, and aid in speciation." Yunis and Yasmineh (1971) focused primarily on structural roles for non-coding DNA, and I don't think aiding in speciation can be considered a "function", but they did also include the basic notion of genome defense. "With the assumption that a portion that comprises some 10 percent of the genomes in higher organisms cannot be without a raison d'etre, an extensive review led us to conclude that a certain amount of constitutive heterochromatin is essential in multicellular organisms at two levels of organization, chromosomal and nuclear. At the chromosomal level, constitutive heterochromatin is present around vital areas within the chromosomes. Around the centromeres, for example, heterochromatin is believed to confer protection and strength to the centromeric chromatin. Around secondary constrictions, heterochromatic blocks may ensure against evolutionary change of ribosomal cistrons by decreasing the frequency of crossing-over in these cistrons in meiosis and absorbing the effects of mutagenic agents. During meiosis heterochromatin may aid in the initial alignment of chromosomes prior to synapsis and may facilitate speciation by allowing chromosomal rearrangement and providing, through the species specificity of its DNA, barriers against cross-fertilization." "Some investigators consider the repeated DNA sequences as the equivalent of 'appendices' of gene evolution and therefore facetiously refer to them as 'junk'. Actually few really think that 'junk' DNA is completely useless (cf. Ohno 1972; Comings 1972)." Now, was Hsu saying that Ohno and Comings did or did not claim that junk DNA is completely useless? The "confer" is ambiguous (it can mean either "compare with" or "consult"), but Hsu was almost certainly aware that Comings was explicit in ascribing function to a large portion of junk DNA. "The hypothesis proposed here is a simple-minded one: constitutive heterochromatin is used by the cell as a bodyguard to protect the vital euchromatin by forming a layer of dispensable shield on the outer surface of the nucleus. Mutagens, clastogens [inducing chromosome breakage] or even viruses attacking the nucleus must first make contact with the constitutive heterochromatin which absorbs the assault, thus sparing the euchromatic genes from damage, unless the detrimental agents are overpowering." Hsu did not apply this to all causes of mutation nor to all types of non-coding DNA -- "Probably heterochromatin is ineffective in protecting euchromatic genes against penetrating ionizing radiations, but against chemicals (especially large molecules) and viruses, the layer of thick chromatin may be an excellent barrier" -- but it has certainly been invoked more broadly by others since. From Patrushev and Minkevitch (2008). Click for larger image. In another example, Vinogradov (1998) proposed that non-coding DNA serves in "buffering the effect of fluctuations in intra-cellular solute composition on chromatin condensation state in its condensed form and on binding of DNA-tropic proteins and other ligands in its decondensed form." There are probably other examples, but these suffice to show that the idea has been in the literature for some time. In fact, non-experts who get excited about the idea when they first think of it should realize that it has been around for almost four decades, and that in all that time it has barely had any impact. I believe this is due in significant part to a chronic lack of supporting evidence and a number of counterexamples -- but more on that later. II. Specific predictions need to be made and tested. There is nothing wrong with the mutation protection hypothesis on the face of it. As I said, at least one of my students first became interested in genome size because of it and we considered it worth testing experimentally. However, there is a crucial difference between thinking up the hypothesis and actually testing it. If anyone is serious about this idea, and doesn't want to be just another person who holds on to the idea with an unjustified tenacity, then they need to present specific, testable predictions that derive from the hypothesis. "the mutation rate induced by chemical mutagens should be inversely correlated with the number of B chromosomes". heterochromatin should be "more concentrated at the periphery of the nucleus (and probably also at the nucleoli) than in the interior". "organisms with more constitutive heterochromatin [should be] more resistant to induced mutations, at least by chemical mutagens". Again, let's take the idea seriously and ask how Hsu's original predictions have fared over the past 35 years. B chromosomes (also called supernumerary chromosomes) are something of an odd choice in this context, because they are not found in all species and they vary in size and number within and among species. By definition, they are not important for survival. They do appear to have effects on recombination (i.e., they increase its frequency), and this has in the past been suggested as a functional role. On the other hand, in high numbers they appear to have deleterious effects on the organisms carrying them. Indeed, B chromosomes were described very early on as parasitic elements (Östergren 1945; one of the first clear expositions of the "selfish DNA" idea), and this remains the most common interpretation (Camacho 2005). Two hypotheses (the Bodyguard hypothesis and the ABCW hypothesis) have been proposed that predict that the amount and type of chromatin in the nucleus will affect induced mutation rates. The Bodyguard hypothesis proposes that a function of constitutive heterochromatin may be to protect euchromatin from chemical mutagens. 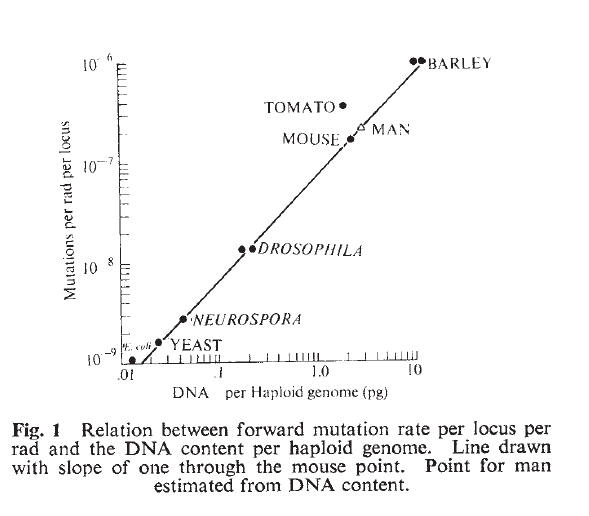 The ABCW hypothesis, states that the mutation rate per locus from ionizing radiation is directly proportional to the haploid DNA content of a species. We altered the total amount of genomic DNA and also the amount of heterochromatin by adding supernumerary B chromosomes (which are largely composed of heterochromatin) to maize (Zea mays L.) cells. We compared induced mutation frequencies at the yellow-green2 (yg2) locus in near-isogenic plants that contained 0 (diploid) or 4 supernumerary B chromosomes (diploid + 4 Bs) to evaluate these hypotheses. We found that the chemical mutagen, EMS, caused significantly higher mutation frequencies in plants that contained 4 B chromosomes (and therefore additional constitutive heterochromatin) than in diploid controls. The Bodyguard hypothesis predicts precisely the opposite result. We also found that ionizing radiation caused significantly higher mutation frequencies in plants with 4 B chromosomes than in diploid control plants. This type of change is predicted by the ABCW hypothesis; however, the extent of the increase observed in this study is much higher than the ABCW hypothesis would predict. The higher mutation frequencies from EMS and radiation in plants that contained 4 B chromosomes was unanticipated, and is the first observation that cells may be more susceptible to mutagenesis when B chromosomes are present. We also compared spontaneous mutation frequencies at the waxy1 (wx1) locus in plants containing 0 or 4-5 B chromosomes, and found that the presence of B chromosomes had no detectable impact. However, the pollen abortion frequency was significantly increased by the presence of 5 B chromosomes. "Evidence for evolutionary conservation argues for a still unknown functional significance of distinct radial higher-order chromatin arrangements. In 1975, T.C. Hsu proposed the 'bodyguard' hypothesis for a possible function of constitutive heterochromatin. He argued that constitutive heterochromatin localized in the nuclear periphery might protect the centrally localized euchromatin against mutagens, clastogens, and viruses. However, evidence for the existence of a protection shield has not been provided so far. The fact that later replicating, gene-poor chromatin is incorporated in the constitutive, gene free heterochromatin to form a chromatin shield in the nuclear periphery cannot be easily integrated into this hypothesis. While G-dark band chromatin contains tissue-specific genes, these genes are certainly not of minor importance as compared with the housekeeping genes that are localized in G-light band chromatin in the interior nuclear compartment. The finding in the human fibroblast nuclei that—in contrast to lymphocyte nuclei—both HSA18 and 19 territories are apparently in contact with the nuclear envelope and thus similarly exposed to mutagens, which will enter the nucleus, presents another difficulty. Why should gene dense HSA19 be better protected in lymphocyte nuclei than in fibroblast nuclei? Furthermore, in the light of the bodyguard hypothesis, we would expect to observe DNA damage preferentially in the peripheral chromatin shield. However, several reports indicate a non-random distribution of double strand breaks, as well as endonuclease- or radiation-induced chromosome aberration sites were preferentially observed in the gene-dense G-light bands." Again, there may be data out there that support the mutation protection idea, but so far it is not looking good for the hypothesis. It is an interesting bit of historical trivia that some early work on genome size diversity was funded by the US Atomic Energy Commission, much as the human genome sequencing initiative was supported by the Department of Energy. 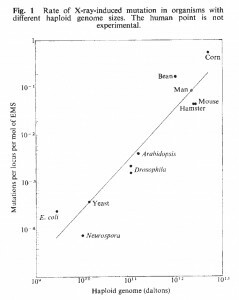 In the 1960s and 1970s, there was interest in patterns of sensitivity to radiation and their potential relation to genomic properties including genome size. 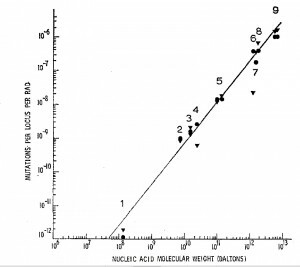 In general, these studies reported a positive correlation between mutagenic sensitivity to radiation and DNA content (Sparrow and Evans 1961; Sparrow and Miksche 1961; Sparrow et al. 1965, 1968; Baetcke et al. 1967; Abrahamson et al. 1973; Wolff and Abrahamson 1974; Athanasiou and Heddle 1975; Heddle and Athanasiou 1975; Trujillo and Dugan 1975). 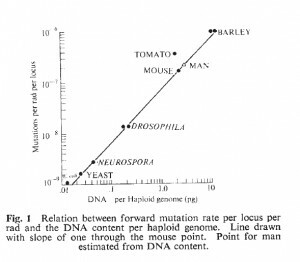 That is to say, more DNA means more, not less, sensitivity to radiation-induced mutations on a per-locus basis. From Abrahamson et al. (1973). Click for larger image. From Trujillo and Dugan (1975). Click for larger image. From Heddle and Athanasiou (1975). Click for larger image. Hsu's predictions do not seem to have stood up well to testing, but the important point is that he proposed them and allowed his hypothesis to face empirical scrutiny. Likewise, current proponents of the mutation protection hypothesis need to follow in this tradition. III. Previous observations need to be explained. Species exposed to intense UV (e.g., on land or in freshwater in the Arctic, pelagic plankton, etc.) do not appear to have large genomes. On the other hand, some very large genomes are found in deep-sea invertebrates. Among vertebrates, species with high metabolic rates, and presumably more free oxygen radicals, have smaller genomes than species with lower metabolic rates. There can be substantial differences in genome size among similar organisms, for example as in onion and its relatives or among salamanders. Despite claims to the contrary based on small and questionable analyses, there are no clear relationships between genome size and lifespan. 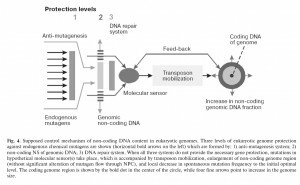 Transposable elements, which are the primary contributor to genome size, can cause a range of mutations through insertion into genes or by causing large deletions by illegitimate recombination, the latter of which is especially likely with the long terminal repeat (LTR) elements that are common in plants. DNA content obviously can be amplified in somatic cells by endoreduplication, but this tends to be in cells involved in ion exchange, protein production, etc., and not ones exposed most to mutagens (such as the skin exposed to UV). Overall, the mutation protection idea has intuitive appeal, which is why it was proposed so early and why it continues to pop up as an apparently independent invention among interested non-experts. As I said, I am happy to consider it as a legitimate hypothesis -- but only if it moves well beyond the usual pattern in which it is proposed as though it were new, accepted without supporting evidence, and defended through dismissal of obvious counter-evidence. 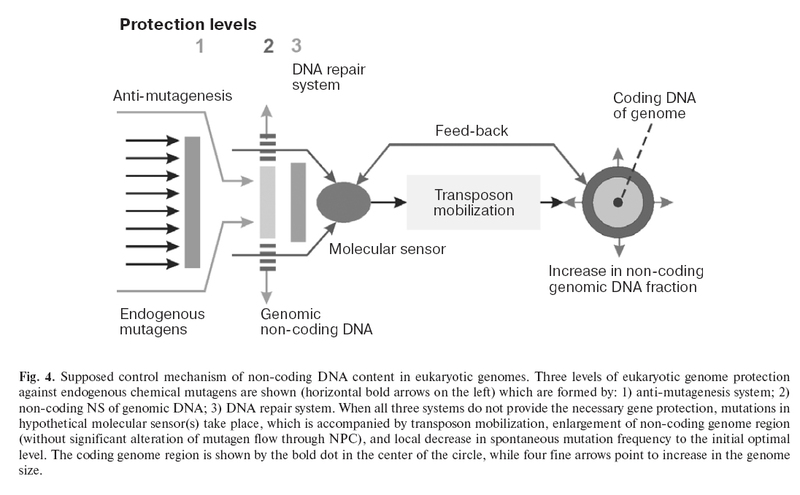 The null hypothesis, that much of the non-coding DNA in eukaryotic genomes does not have an organismal function, also has to be acknowledged as at least equally plausible in light of our understanding of genome biology. Abrahamson, S., M.A. Bender, A.D. Conger, and S. Wolff (1973). Uniformity of radiation-induced mutation rates among different species. Nature 245: 460-462. Athanasiou, K. and J.A. Heddle (1975). 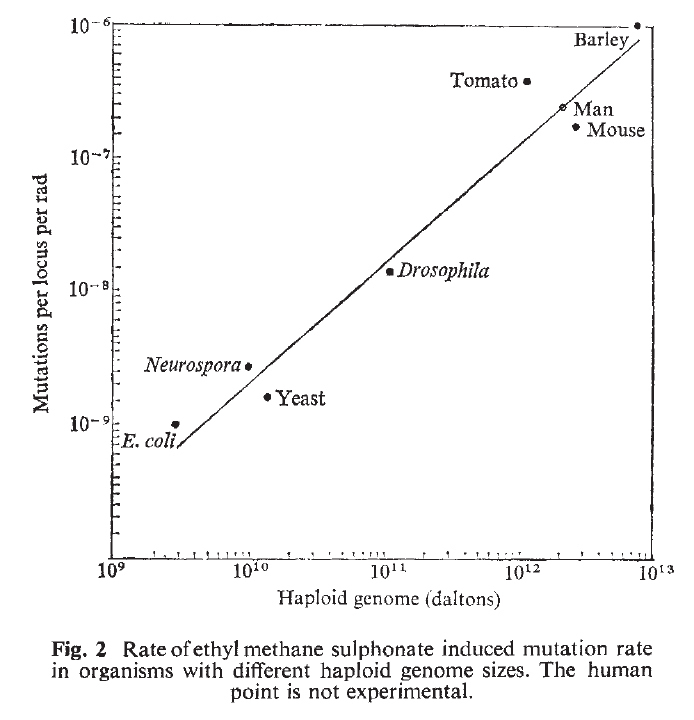 EMS induced mutation rates and their relation to genome size. Canadian Journal of Genetics and Cytology 17: 455. Baetcke, K.P., A.H. Sparrow, C.H. Nauman, and S.S. Schwemmer (1967). 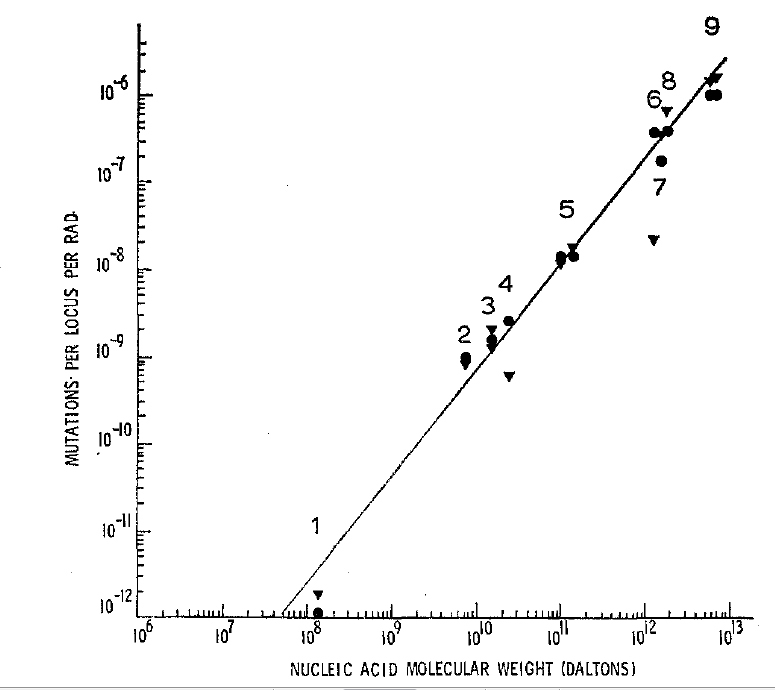 The relationship of DNA content to nuclear and chromosome volumes and to radiosensitivity (LD50). Proceedings of the National Academy of Sciences of the USA 58: 533-540. Camacho, J.P.M. (2005). B chromosomes. In: The Evolution of the Genome, ed. T.R. Gregory. Elsevier, San Diego, pp.223-286. Comings, D. E. (1972). "The structure and function of chromatin." Advances in Human Genetics 3: 237-431. Heddle, J.A. and K. Athanasiou (1975). Mutation rate, genome size and their relation to the rec concept. Nature 258: 359-361. Ohno, S. (1972). So much "junk" DNA in our genome. Evolution of Genetic Systems. H. H. Smith. New York, Gordon and Breach: 366-370. Östergren, G. (1945). "Parasitic nature of extra fragment chromosomes." Botaniska Notiser 2: 157-163. Patrushev, L.I. and I.G. Minkevich (2008). The problem of eukaryotic genome size. Biochemistry 73: 1519-1552. Sparrow, A.H. and H.J. Evans (1961). Nuclear factors affecting radiosensitivity. I. The influence of nuclear size and structure, chromosome complement, and DNA content. Brookhaven Symposia in Biology 14: 76-100. Sparrow, A.H. and J.P. Miksche (1961). Correlation of nuclear volume and DNA content with higher plant tolerance to chronic radiation. Science 134: 282-283. Tanabe, H., F.A. Habermann, I. Solovei, M. Cremer, and T. Cremer (2002). Non-random radial arrangements of interphase chromosome territories: evolutionary considerations and functional implications. Mutation Research 504: 37-45. Sparrow, A.H., K.P. Baetcke, D.L. Shaver, and V. Pond (1968). The relationship of mutation rate per Roentgen to DNA content per chromosome and to interphase chromosome volume. Genetics 59: 65-78. Trujillo, R. and V.L. Dugan 1975. Radiosensitivity and radiation-induced mutability: an empirical relationship. Rad. and Environm. Biophys. 12: 253-256. Vinogradov, A.E. (1998). Buffering: a possible passive-homeostasis role for redundant DNA. Journal of Theoretical Biology 193: 197-199. Weber, D.F., M.J. Plewa, and R. Feazel (2007). Effect of B chromosomes on induced and spontaneous mutation frequencies in maize. Maydica 52: 109-115. Wolff, S., S. Abrahamson, M.A. Bender, and A.D. Conger (1974). 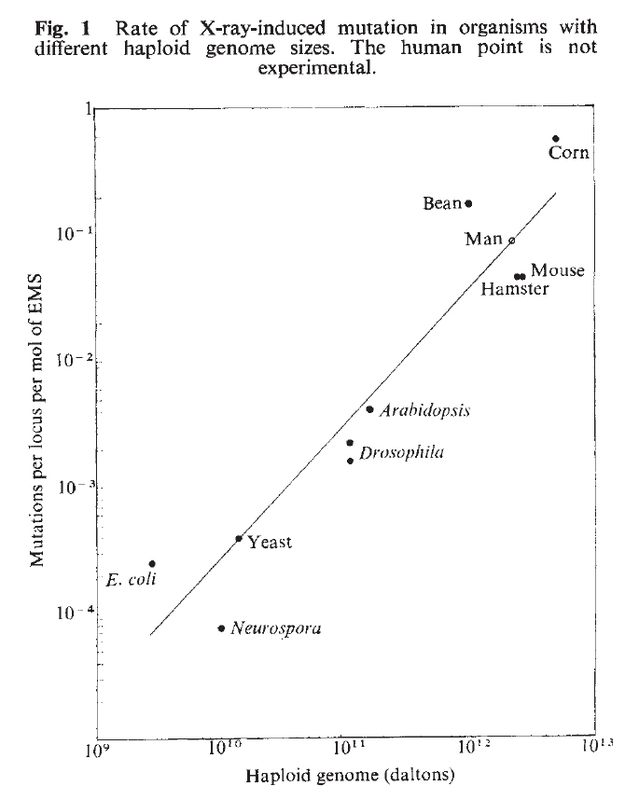 The uniformity of normalized radiation-induced mutation rates among different species. Genetics 78: 133-134. Yunis, J.J. and W.G. Yasmineh (1971). Heterochromatin, satellite DNA, and cell function. Science 174: 1200-1209.